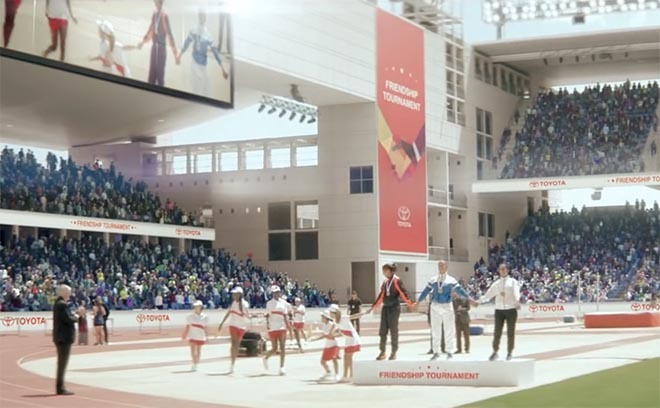 Toyota has used the opening of the Rio 2016 Olympic Games to launch “Stand Together”, an integrated advertising campaign connecting the brand with team work. The Toyota Stand Together commercial at the heart of the campaign features people across the world, from Toyota team members to skydivers to Team Toyota athletes Sanders and Purdy joining hands and celebrating teamwork. Set to the track of The Spencer Davis Group’s “Gimme Some Lovin’,” the spot communicates Toyota’s commitment to mobility that facilitates shared experiences. The commercial also includes a call to action. For every person who creates a video of people joining hands and shares it using the campaign hashtag, #LetsJoinHands, Toyota will donate $20 to United Way, up to $250,000. In addition, Toyota will mix content from user and influencer submissions into pre-roll and social videos, continuously delivering fresh edits throughout the media run. A prominent portion of the Toyota Stand Together campaign will be the #LetsJoinHands outdoor touchboard installations that combine live video feeds with real-time collaborative drawing tools to create a connective engagement between New York City’s Herald Square and Los Angeles’ Hollywood and Highland from August 12-14. Users have the opportunity to email or tweet video captures of their drawing sessions directly from the screens. An advanced cloud-based rendering engine automatically generates highlight reels featuring users’ digital drawings, suited to social sharing. The touchboards aim to capture the magic of the engagement while immortalizing these fleeting, yet genuine connections and collaborations. “Toyota is a brand that is founded on the power of movement and over the decades has enabled people to move forward and explore. The “Stand Together” campaign is a reflection of the physical and emotional places we can go and the goals we can achieve together. By giving people a chance to engage with technology and people in unexpected ways, the campaign extends and redefines what it means to join hands and we hope to start a conversation around teamwork,” said Fabio Costa, executive creative director, Saatchi LA. The Toyota Stand Together campaign was developed at Saatchi & Saatchi Los Angeles by chief creative officer Jason Schragger, executive creative director Fabio Costa, creative directors Leo Circo and Chris Pierantozzi, associate creative directors/art directors Kevin Schroeder and Jeremy Carson, associate creative directors/copywriters Randy Quan and Dan Sorgen, executive director, integrated production & operations Lalita Koehler, director of content Sara Seibert, executive content producer Pamela Parsons, senior content producer Jennifer Vogtmann, content producer Marina Korzon, executive digital producer Tarrah Barbour, associate producer Kat Olschnegger, director of business affairs Keli Christy, business affairs manager Erin D’Angelo, associate project manager Angela Montoya, group account directors Steve Sluk and Bryan DeSena, account director Patrick Young, account supervisor Joshua Phillips, account executive Brad Sanders, assistant account executives Kate Jensen and Natalie Johnson, social engagement director Allie Burrow, PR director Mike Cooperman, group planning director Evan Ferrari, senior planners Julienne Lin and Shaunt Halebian, executive communications director John Lisko, paid media director Chris Nicholls, earned media director Romina Bongiovanni, associate director of social media Karen Ram, social media supervisor Talia DiDomenica, media supervisor Helen Burdett and Sarah Buchalter, media planner Mitchell Gilbert, social media assistant Patrick Butcher, Toyota USA group vice president marketing Jack Hollis, marketing communications VP Cooper Ericksen, corporate manager Jim Mooney, corporate manager Scott Thompson, brand communications manager Russ Koble, national manager Mia Phillips, brand, multicultural and crossline mrketing strategy Mia Phillips, brand & multicultural manager Landy Joe, social media marketing manager Florence Drakton. Filming was produced at Anonymous Content by director Chris Sargent, director of photography Andre Chemetoff, senior executive producer Gina Zapata, executive producer Sue Ellen Clair, head of production Kerry Haynie, line producer Brian Eating. Editor was Stewart Reeves at Work Post with executive producer Marlo Baird, producer Tita Poe, assistant editor Brian Meagher. Visual effects were produced at A52 by VFX supervisor Andy McKenna, CG supervisor Andy Wilkoff, 2D artists Cameron Coombs, Michael Vagilenty, Adam Flynn, Rod Basham, Gavin Camp, Michael Plescia, finishing artists Kevin Stokes and Gabe Sanchez, matte painters Dark Hoffman and Marissa Krupen, 3D artists Tom Briggs, Dustin Mellum, Kirk Shintani, Josh Dyer, Jon Balcome, Manny Guizar, Michael Cardenas, Michael Bettinardi, Joseph Chichi, animator Earl Burnley, producer Stacy Kessler-Aungst, head Of production Kim B. Christensen, executive producer Patrick Nugent, colourist Paul Yacono. Sound was designed at Barking Owl and mixed at Formosa Group by Peter Rincon. Music is “Gimme Some Lovin'” by The Spencer Davis Group, written by Steve Winwood, supervised at Saatchi & Saatchi LA by Kristen Hosack.